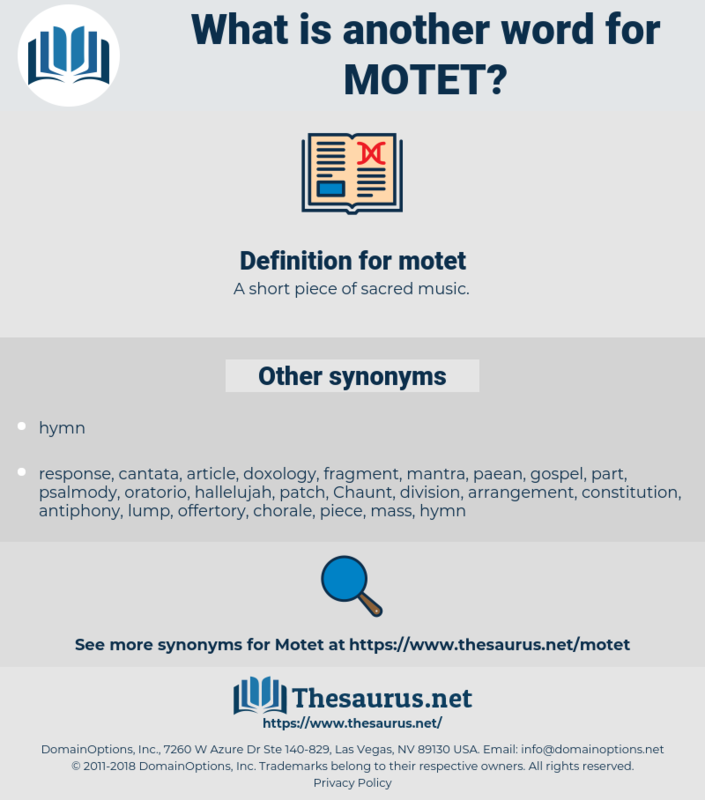 What is another word for motet? A short piece of sacred music. 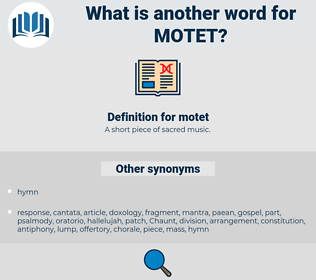 mayday, mint, monte, mohammed, medea, Mete, moat, matey, mote, minuend, mete out, man-made, moment, matt, monad, meaty, mt, monday, mined, mahomet, mad, minded, manned, muhammad, mid, matte, med, manhood, mantua, mande, minuit, mammoth, momotidae, manda, mennonite, manihot, maund, middy, mamet, munda, mouth, minute, monument, mitt, mead, midday, mot, Mothy, mandate, maundy, myoid, meet, mode, maidhood, method, mood, manteidae, mentha, madia, mound, maidu, mahout, moody, myth, mayweed, mountie, mit, maimed, memento, mind, monod, mantid, moated, mediated, manteodea, manat, mud, motto, meted out, minutia, meat, mut, mod, moot, monet, made, maid, meed, mount, mounted, momot, mimidae, moth, may day, metadata, matai, menotti, meade, montia, mite, muddied, Mahdi, mend, manumit, mammut, muddy, monody, meadow, matthew, minuet, manhunt, math, manta, meth, mat, manet, mediate, midway, manatee, month, minnewit, mutt, monied, muted, mammutidae, manidae, moiety, mott, Mohammad, MDI, matted, mute, maenad, mate, mahound, monnet, mutate, moneyed, miniate, md, mated, meditate, midi, Mutawa, mantidae, mediety. musical composition, piece, piece of music, composition, opus.